through online is 07-11-2018. 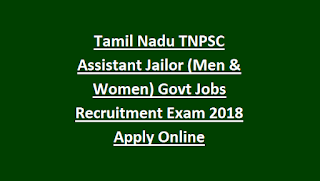 Interested and eligible Tamil Nadu state candidates can apply for this Assistant Jailors Posts through the official website of TNPSC is www.tnpsc.gov.in or www.tnpscexams.in. The candidates will be shortlisted based on the written examination, oral test and physical test. The other information of age limit, salary, application fee, educational qualifications and how to apply online, exam pattern and syllabus are given below for the Assistant Jailor (Men & Women) posts in TNPSC Recruitment Exam Notification 2018. 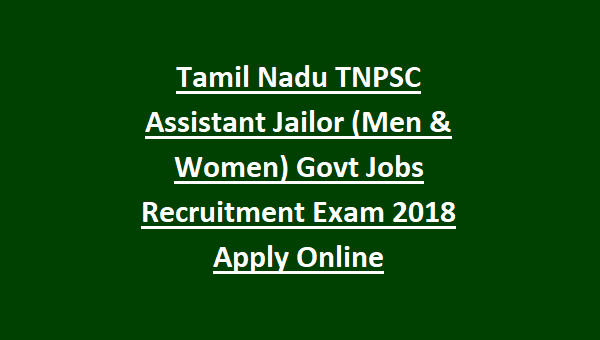 There are totally 30 available vacancies are for Assistant Jailor Posts in TNPSC Recruitment 2018. As on 01-07-2018 the age limit for the candidates is in between 18 – 30 years. There is upper age limit for SC/ SC (Arunthathiyar)/ BC/ MBC and Destitute windows of all Categories. The educational qualification for the Assistant Jailor Posts is candidates should have done Graduate Degree from recognized University. Candidates should have Knowledge on Tamil. The salary offered for the shortlisted candidates is Rs.35400 – 112400/-. The Registration fee for the candidates applying for Assistant Jailor is Rs.150/-. The Examination fee for the candidates is Rs.150/-. Candidates can pay the fee through online. There is fee for the SC/ST, Differently abled persons and destitute windows candidates. The candidates will be selected based on the written Examination Test, Oral Test and Physical Test. The written examination will be conducted on 06-01-2019. The written examination will be comprising of Degree Standard Objective Type questions (Paper I & paper II) with total marks of 680 and duration of 3 hours. Minimum qualifying marks for OC – 272 marks and Other than OC – 204 marks. Interested candidates can apply for the Assistant jailor (Men & Women) posts through online official website of TNPSC is www.tnpsc.gov.in or www.tnpscexams.in from 08-10-2018. The Last dates to submit the application form is 07-11-2018. Candidates can pay the application fee at the time of form submission. For more information candidates can refer in the Official notification of TNPSC.